Following a military coup, the eruption of armed conflict, robust intervention by France in 2012, and elections in 2013, the United Nations Multidimensional Integrated Stabilization Mission in Mali (MINUSMA) was deployed, leading to a peace agreement in 2015. Yet the situation remains fragile and terrorist attacks seem to be spreading. 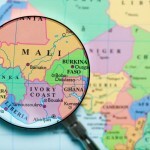 Canada has a long tradition of co-operation with Mali. After the suspension of bilateral aid following the coup, Ottawa re-established co-operation in 2014. Mali is on the short-list of African countries where Canada could soon deploy military and police in a UN Peace operation. Who are the actors, and what are the dynamics and key issues, in the Malian and regional contexts? What are the options and risks for the Canadian government in this situation, especially in the areas of security and governance? Bruno Charbonneau & Adam Sandor, professors and researchers at FrancoPaix Centre, who will speak on the security-governance-development NEXUS in Mali and dilemmas for Canada. Louise Ouimet, former Canadian Ambassador in Mali, member of the GRA/CIC, who will speak on challenges and opportunities for the Canada-Mali partnership. The event is free and will be mainly in French. Arrive early to reserve your spot.